Peter Watkins was concerned about the possibility of nuclear war from the beginning of his career, but then again, who wasn’t? Though nuclear brinksmanship once again bubbled to the surface of public life, it has yet to reach the Cold War fever pitch that produced Ingmar Bergman’s Winter Light, Stanley Kubrick’s Dr. Strangelove, and Watkins’ second film for the BBC, The War Game. A pseudo-documentary in the mode of the previous year’s Culloden, The War Game, released in 1965, looks to a plausible near-future in which Britain’s central government has dissolved and a network of regional commissioners and emergency committees have been set up around England in response to nuclear tensions between the Russians, the Chinese, and the Americans. 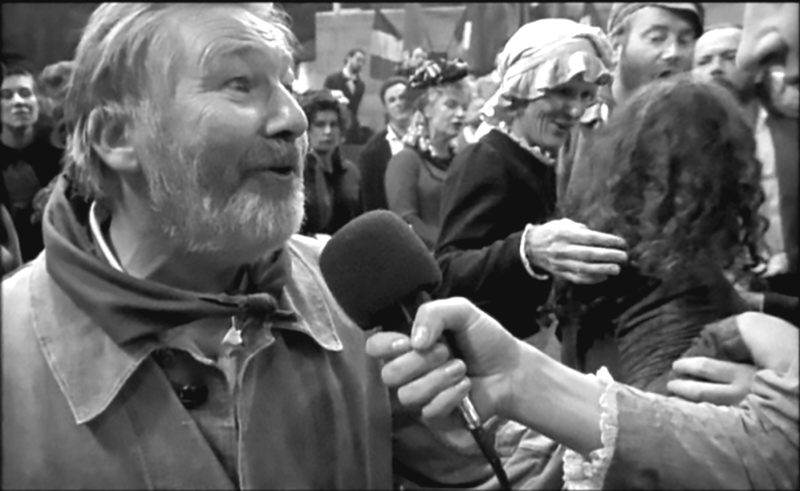 Watkins’ fictional film crew follows a group of London women evacuated to Kent in the south east and includes man-on-the-street interviews and footage of day-to-day life. “What am I going to feed them on? Are they colored?” one woman asks when told to expect ten evacuees in her home. “No, there won’t be a war. I’m quite convinced of that,” says another local. Shopkeepers gouge the prices of sandbags and wood needed to build shelters. Throughout the film, BBC presenter Michael Aspel stentoriously intones warnings like: “Should Britain ever thus attempt the evacuation of nearly twenty percent of her entire population, such scenes as these would be almost inevitable.” “Did you know this?” he asks people on the street about NATO’s increasing reliance on nuclear deterrents. This question will appear again and again in 1987’s The Journey. “This could be the way the last two minutes of peace in Britain look” Aspel says gravely as alarms blare and a family scrambles for cover. When the heatwave from the first blast strikes the town, the image inverts to negative: eyeballs melt, skin and furniture burns, a boy screams. The extreme heat creates a firestorm, sucking in winds up to 100 miles per hour. “This happened after the bombing of Hamburg, at Dresden, at Tokyo, and at Hiroshima” we learn. The camera shakes violently, and scenes of people on fire are intercut ironically with quotes from religious and political leaders predicting the peaceful, responsible use of nuclear weapons, and average joes blithely agreeing with the necessity of retaliation in case of attack. “Within this car,” we are told, “a family is burning alive.” The sequence is fairly silly, and not a little kitschy, but also tremendously effective. The film only grows more bleak. Police shoot people like animals to put them out of their misery. There are 50,000 corpses in Kent alone, followed by hunger strikes and a populace struggling with scurvy. A child is bitten by a rat and dies because all the medicine is gone. The short film’s most striking image is as quiet as it is unexpected: a bucket full of wedding rings collected from the dead in the hopes of identifying the bodies from the rings’ inscriptions. It’s easy to see why such an alarmist film was banned by the BBC, and also why it was so heartily embraced by the Academy, who gave it the Best Documentary Feature Oscar. The tension between carefully-researched fact and genuinely unsettling images created a subjunctive mood that gave the issue a powerful filmic immediacy, despite being made for television. This testing of the limits of the possible seriously troubles the line between education and fearmongering. Watkins’ ardor for his subject matter is understandable in the face of near-total media silence on nuclear armament, yet his belief in the power of the filmed image to drive social change (an article of faith that has animated his entire career) borders here on the reckless. His evocation of the nuclear horrors of Germany and Japan reeks of opportunism, no matter how viable. But responsible art is never very interesting. It’s easy to snicker at the film’s dire final warning: “It is entirely possible that what you have seen happen in this film will have taken place before the year 1980,” yet here we stand on the precipice once again. Or more to the point, as Watkins’ further work makes clear, we never left it. Like Godard, Watkins embraced video technology in the mid-1970s. Unlike Godard, however, Watkins has worked almost exclusively in television ever since, beginning with the 1974 Norwegian-Swedish biopic Edvard Munch (which received theatrical distribution in the United States) and the 1975 Danish documentary The Seventies People, about a suicide epidemic. The Trap (Fällan), made for Swedish television in 1975, registers an incipient unease with the medium itself; it marks a sort of nihilistic, bi-polar professional death drive that has seen Watkins advocate for the end of TV as fervently as he has embraced its political potential. The Trap is a coming out moment for Watkins’ formerly tacit critique of the mass media, and is his first film to center on watching people watch other people. The whole film takes place inside the cramped living quarters of John, a Swedish scientist, his wife Margareta, and their son Peter in a joint U.S.-Soviet-Swedish nuclear waste station 30 meters underground, on “the last evening of this century.” Margareta and Peter never go outside and live their lives vicariously through the television. They live below Sweden’s western coast and haven’t seen the beach in over three years. Society is descending into chaos on the surface and everyone eats soy mash and “carbo-cakes.” John’s outspoken pacifist brother Bertil is coming with his son Bo to spend New Year’s with the family. Margareta and Peter watch footage of them passing through draconian security measures to enter the station, interspersed with their regularly scheduled programming—it’s all the same entertainment to them. The evening grows tense when Bertil confronts the officers and workers from the different countries’ delegations whom John has invited to the party. In the world of the film, the U.S. and U.S.S.R. have become trade partners, a scenario Watkins presents as even more nightmarish than the Cold War, which at least kept the superpowers somewhat in check. The coalition dropped atomic bombs on the Middle East in the 80s and are currently preparing for the mass sterilization of Africa. “Don’t forget: a lot of people are scheduled to be killed this New Year’s Eve weekend. Don’t be one of them. Now, Bing Crosby,” the family hears on TV. Ever the cinematic prognosticator, Watkins presages the dark satire of Paul Verhoeven’s RoboCop and Starship Troopers. Viewers are encouraged to support the troops; “Everything that we’ve got, they’re getting for us!” Especially those guarding oil reserves in “the region formerly known as the Middle East.” “Remember,” an ad for the Boy Scouts chirps, “America’s man-power begins with boy-power.” Ever also the ham-fisted moralist, Watkins occasionally intersperses such mockery with stills of suffering African children. He’s not above self-critique, though, taking on an antagonistic role as the unseen interviewer who bullies Bertil with reactionary and increasingly unhinged dogma. “Is this your way of dealing with people all the time?” he berates him, “Hitting them on the head with this kind of childish Marxist rhetoric? We heard this in the 70s! It means absolutely nothing now.” When Margareta, John, and Peter watch Bertil get arrested on their TV, Watkins simply says, “There’s nothing you can do about it.” It’s not clear if he’s speaking to them or us. Watkins briefly returned to film for his next outing, 1977’s Evening Land (Aftenlandet). It’s his least distinctive work and his most polished. 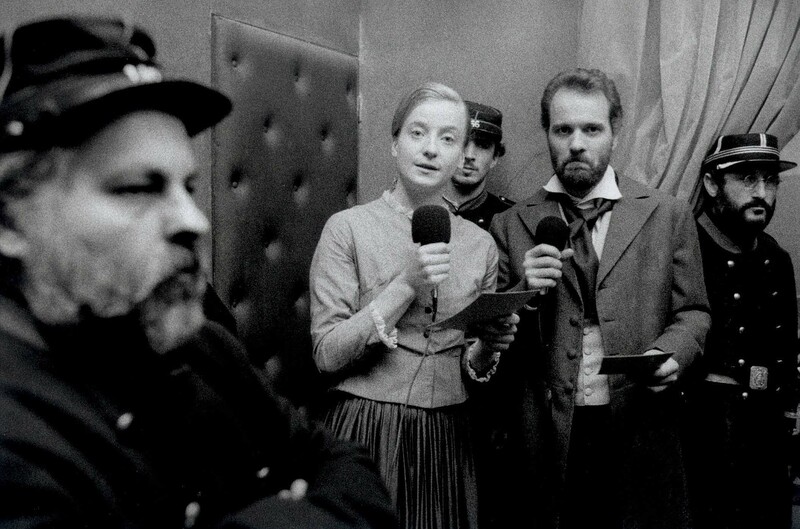 Recalling Pier Paolo Pasolini’s Teorema, Krzysztof Kieslowski’s The Scar, and Eisenstein’s Strike, it concerns the abduction of Danish Economic and Foreign Minister Jorgen Falk by supporters of a factory strike. Watkins paints on a broad canvas that foreshadows La Commune (Paris, 1871), employing 192 non-professional actors. There’s no lead character; all viewpoints (union, management, government, media, etc.) are represented. Though it features first-hand interviews and occasional pop underscoring, Evening Land feels more Frederick Wiseman than Peter Watkins, with a clear liberal point of view emerging through the editing and cinematography instead of unambiguous explication, Watkins’ usual method. Once again, most characters experience the events through their televisions. 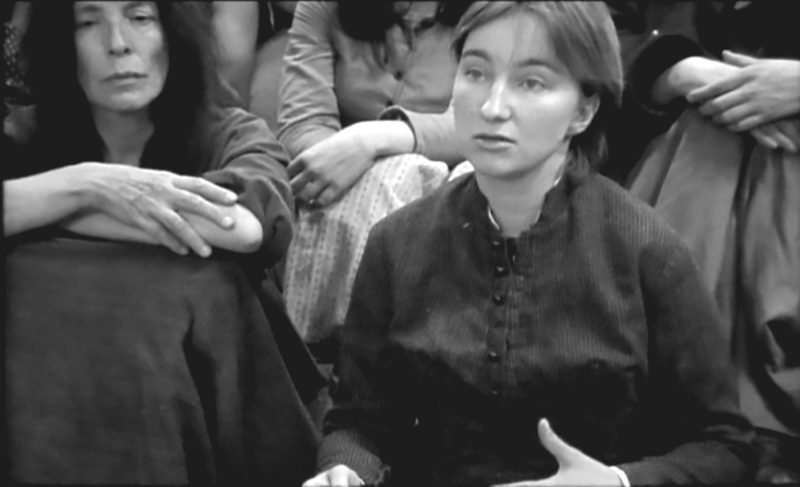 In another step toward the communal creation of La Commune, Watkins and his co-creators Poul Martinsen and Carsten Clante devised the film “in collaboration with the cast, many of whom are directly expressing their own opinions and feelings.” Without denying his own biases, Watkins is making a concerted effort to allow for a multiplicity of viewpoints. It would be ten years before Watkins released another film, though there would be about one and a half hours of material for every elapsed year once he finally did. 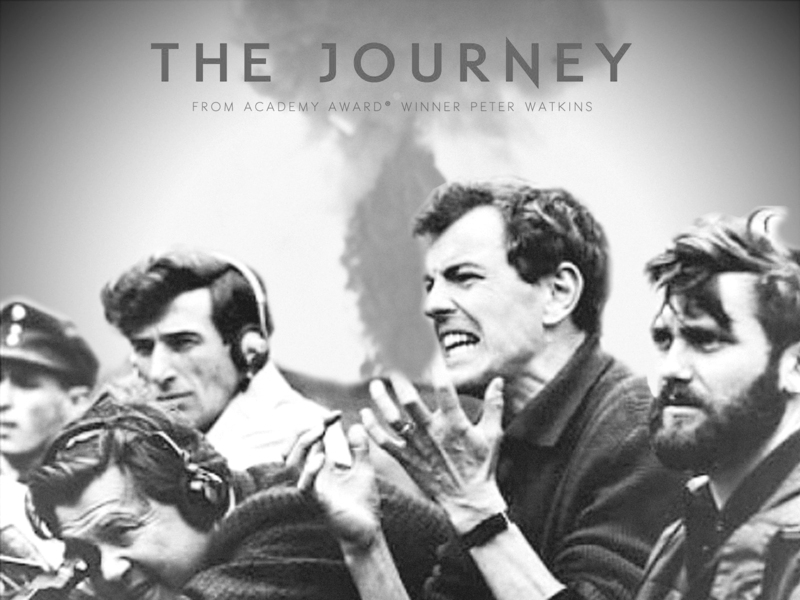 The 873-minute, 19-episode documentary The Journey (Resan) is Watkins’ magnum opus, a mammoth, globe-trotting line in the sand that methodically peels back the secrecy and misinformation surrounding nuclear proliferation. Taking in locations that include Hiroshima; Toulouse, France; the Puget Sound; Cuernavaca, Mexico; the Mariana Islands; a farming cooperative in Mozambique; and many more, The Journey creates an intricately detailed, rhizomatic portrait of the “system” Watkins so often rails against. Armed with a seemingly endless supply of facts and figures, he leaves no plutonium rod unturned. It’s a work of profound, maniacal ambition and unalloyed Watkins: bellicose yet tender, expansive yet intimate, arrogant yet humane. If the film’s obsolescence controverts its messiah complex, Watkins’ cri de coeur is no less urgent on its thirtieth anniversary than when it was released. Well, hello. My name is Peter Watkins. I’m an English filmmaker, at this time living in Sweden, and it will be my voice that you hear from time to time during The Journey as narrator. It’s my intention to give you some additional information and also to comment on the process of the film. I do hope you will not feel that there is anything objective about the information I’ll give you. Certainly, all of us working on The Journey have tried very hard with our research to make our information as accurate as possible, but I must emphasize that our presentation of the information is biased, due to our very strong feelings about the subject of this film. The first such people we see live in the Hebrides, off the northwest coast of Scotland. “These people have been denied information by the system in which they live. They will be the first of many you will meet in this film.” And, further, in case it wasn’t clear: “This film is about systems, the systems under which we all live, and the mechanisms they use to deprive us of information and participation.” “Did you know this?” he often asks both the film’s participants and the audience through his narration. “I didn’t,” he just as often admits. It’s classic muckraking, bringing to light the secrets on which oppressive structures thrive. Watkins is, however, far more interested in the people doing the work of exposure themselves. He interviews a peace worker in Bangor, Washington who intentionally moved next to the train tracks so she could monitor the movements of the mysterious white trains, straight out of The X-Files, which bring nuclear weapons into the Trident submarine base that employs 95% of people in Kitsap County, across the sound from Seattle. In a later episode, the woman tells of nearly 250 communities along the train’s route from the Pantex plant in Texas to Bangor and then to the East Coast who keep vigil on the train’s movement and raise awareness in their towns of what’s passing through them, occasionally even sitting on the tracks, treating the trains as though they were carrying Jews to the concentration camps. Throughout this film, we will be showing you examples from around the world of current television public affairs coverage, particularly the evening news. And in order to show you the increasing rapidity of television cutting, a phenomenon which is as marked in the contemporary cinema, we will indicate each direct cut or edit from one image to another with a noise such as (beep) or (blip) or occasionally (higher blip). You will hear (harmonic beep) when additional information such as a map or a caption is jumped onto the screen on top of the original image. We will also indicate in this way the internal cuts we have made to our own scenes of dialogue in the film. Please remember that each of these cuts or changes in image means that a specific editorial decision has been made by the television producer or by the editor or by the film director to change the primary visual information we are receiving. Thankfully, he employs this system only sporadically, or the already challengingly film might have become torturous. He follows this explanation with a short tutorial on editing. Though it’s difficult to believe the general public was this unaware of how news media function, it clearly illustrates Watkins’ deep conviction, shared with Schoolhouse Rock and NBC’s “The More You Know” public service announcements, that knowledge is power. Like all agitprop, The Journey is most effective when it’s least obvious. Watkins creates constant disjunctions between sound and image, employing non-sequitur shots the meaning of which only become apparent later. He often chops and remixes time, such as when he introduces a survivor in Hiroshima and then says that tomorrow she will lose thirteen of her family members. This recursive structure creates the sense of an eternal now in which the threat of nuclear extinction is ever-present. Watkins also builds a complex sonic tapestry that subtly underlines the interconnectedness of all life on Earth, as in episode two when he overlays the sound of footsteps on train track gravel with a Polynesian chant and the voice of U.S. Secretary of Defense Caspar Weinberger. This is no belletristic flourish, but an aesthetic expression of Watkins’ core philosophical project. As Naomi Klein did with climate change in her 2014 exposé This Changes Everything, Watkins presents nuclear proliferation as the problem that circumscribes all others, both the root of and the clearest manifestation of global political and economic inequity. Watkins is a self-styled Poirot, rooting through the visual noise to understand the bigger picture. For all the film’s lawyerly argumentation, however, I often wanted to yell, “Speculation!” or “Leading the witness!” while watching it. Watkins leavens his barrage of facts with constant appeals to emotion, yet his method replies so heavily on conjecture that his rhetorical structures nearly collapse. He asks a man protesting the so-called Shamrock Summit between Ronald Reagan and Canadian prime minister Brian Mulroney how he thinks the CBC triages what ends up on the news, and pesters child after child looking at the Hiroshima pictures around the various kitchen tables why they think they were never shown those images in school. It’s a bid for inclusion in form only, as the answers are always clearly prescribed by Watkins’ aggressive tone. Watkins cites the work of Jerry Mander, whose Four Arguments for the Elimination of Television clearly had a profound impact on him. Mander positions television as the means of a silent coup that “takes place directly inside the minds, perceptions and living patterns of individual people. (The) technology makes it possible, and perhaps inevitable, while dulling all awareness that it is happening.” Watkins completely subscribes to Mander’s fatalistic view of the medium and agrees that it might be unredeemable. It’s undoubtedly a large part of why he’s made only two films since The Journey, 1994’s August Strindberg biopic The Freethinker (Fritänkaren), and La Commune. If Watkins’ revolutionary zeal hasn’t dimmed, his confidence in cinema or television’s part in the revolution certainly has. The Internet has largely discredited his belief in the transformative, didactic power of photographs; if anything, the superfluity of images has made empathy even more elusive. We have access to infinitely more images online, yet human society is now one tweet away from ruin. Even if his roadmap is perhaps faulty, Peter Watkins is an unique and optimistic filmmaker, single-mindedly dedicated to an utopian ideal despite the galaxies of evidence to the contrary. If that’s not worth televising, what is?